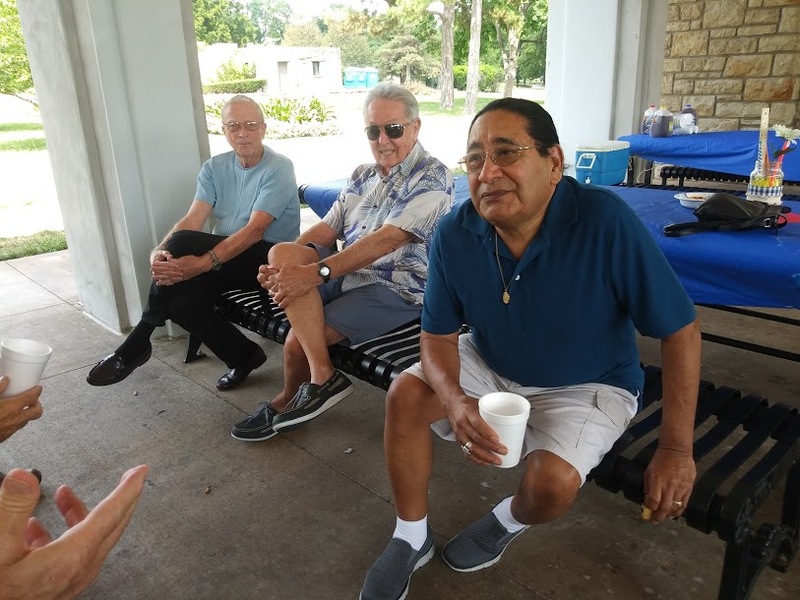 L to R. Dale Oyer, Lupe Candillo, Roger Kaster , Augie Ruf. L to R Jim Carras, George Carras, Merry Krause Becker. 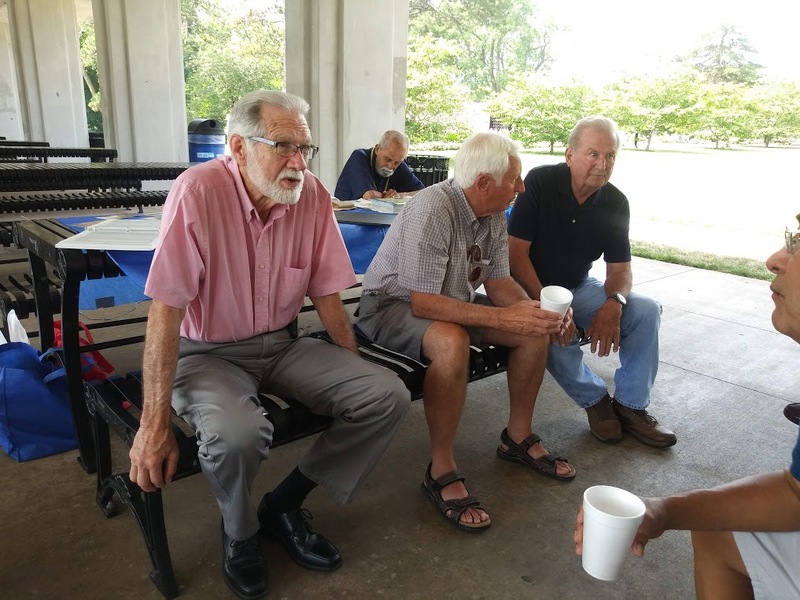 "Click here for Chairman Ron Philgreen's Reunion Letter"
Well, the weather was not quite picnic weather but all 43 of us survived. Maybe Mother Nature was upset with me because we forgot to put her on the invitation list and I didn't have her email address. We all came prepared, however, with our jackets, scarves and blankets. This is Kansas after all. 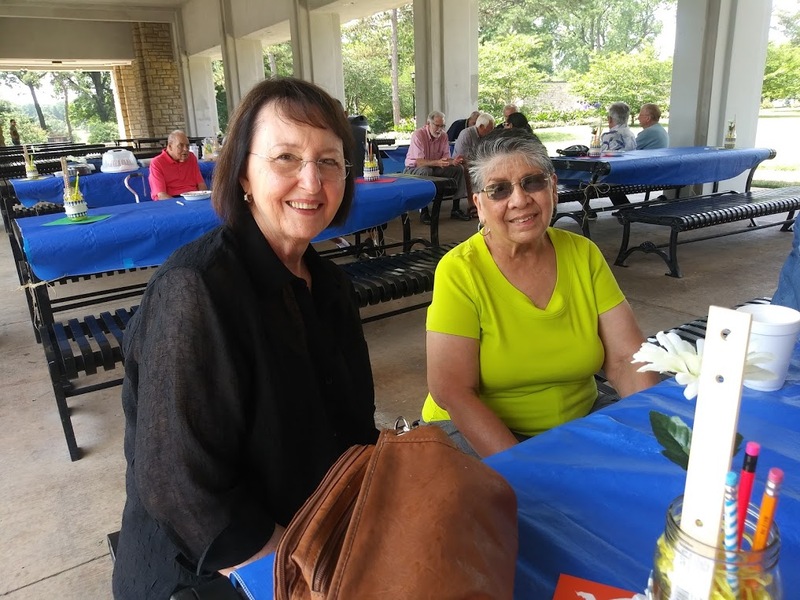 I think Diane's hot coffee took precedence over Elberta's ice tea and the reason I know is because Elberta was offering free bags of ice towards the end of the picnic. Business may also have been a little slow for Gene and Cherlyn's bottled water "booth" according to what they had to take home. Many thanks to all these gals and guy for taking charge of this department. Now the food from Jack Stack's Bar B Que was a different story. It was delicious and we managed to leave very few left overs. Thanks, Jane, for handling that part (a most tasty and important part) of the picnic. The cake from Costco's was also very tasty and Jim's art work (the picture from the invitations) looked very nice on the cake. We managed not to cut into the picture part of the cake so we served cake from all around it and it was very good. I know because I tried it ........................twice! Well, it was half white cake and half chocolate cake and if I was going to tell you it was good I needed to try it .................both colors. Juanita did a good job of taking care of that department. She also had a display of memorabilia donated by Beverly Kerr Martin's family. We had plenty of "50's" music provided by Carol but there was more visiting going on than us "70's" out there dancing. I think Jim Carras' brother, George, looked like he could have put us all to shame on the dance floor. He is a proud graduate from the WHS class of 1941. Yes, you do the math and you will find that he is a bit older than us but he could easily pass for being a member of the class of '57. He was a delight to meet and thank you, Jim, for bringing George with you. We had a little something to give to the person who traveled the most miles to get here and Jim. coming from Texas, easily took the prize which was donated by Juanita. The tables looked very nice with their blue table cloths and beige colored runners down the middle and a cheery looking basket of apples placed in the middle of each table. That made a nice center piece and also a nice take-home treat for anyone who so desired. To finish off the casual and picnic-type look of the table decorations there was a mason jar filled with sunflowers placed at each end of the tables. The jars were also dressed for the picnic with a band of blue checked gingham around the middle with a strip of fringed beige canvas around the gingham. Thanks to Barbara Field for all her work on making the tables look great. Everyone was so willing to help before the picnic to get the tables ready and also after the picnic to get the tables "unready" (we have too many teachers among us for me to be making up words so pretend I didn't write 'unready"). Among the many helpers there was Carolyn, so perky and bright and early! Again, thanks for everyone's help. This truly was a team project and it took everyone's help to make it a successful one and guess what,,,,,,,,,,,,,,,,,,,,,,,,we were successful! As for the guest list, these people were special guests,Lisa Herrington and her brother, Nick Langley (Tom Langley's children) and I apologize for not introducing them as they arrived. Art White and Cherlyn spent some time visiting with them and looking through the 50th Reunion Book. Another special guest, as I mentioned above, was George Carras, Jim's brother. We were happy to see all the special guests and also our classmates that were here at a Westport 1957 function for the first time. I believe that Joy Young and his wife, Vera, from Mound City, KS. 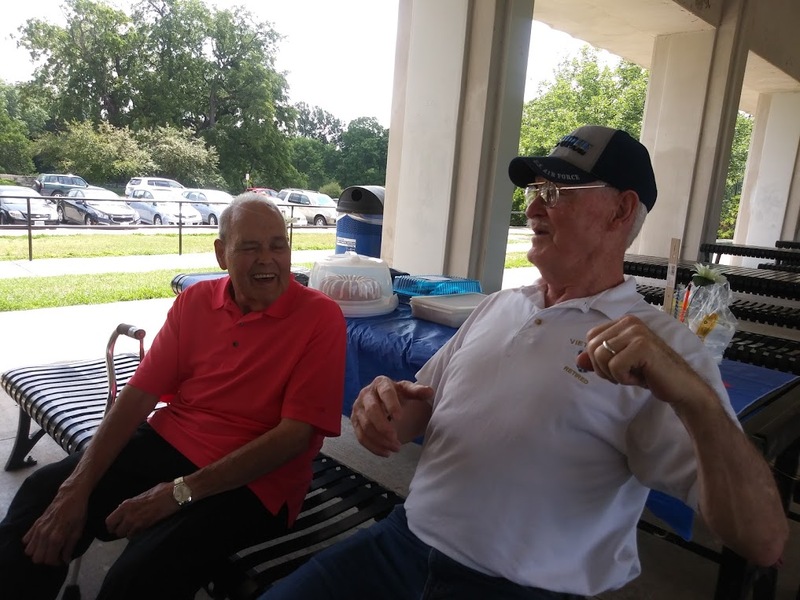 had not been to any of our reunions as well as Richard Bayless and his wife, Vicky, of Raytown (Vicky was the one who made the delicious deviled eggs)..It was good to see John Joe Reyes and his wife, Virginia again as well as Janice McClintock Rowe and to meet her husband, John Rowe. 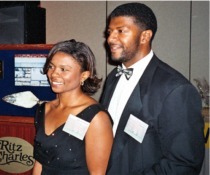 It was also good to see Haskel Fisher and his wife, Christine. 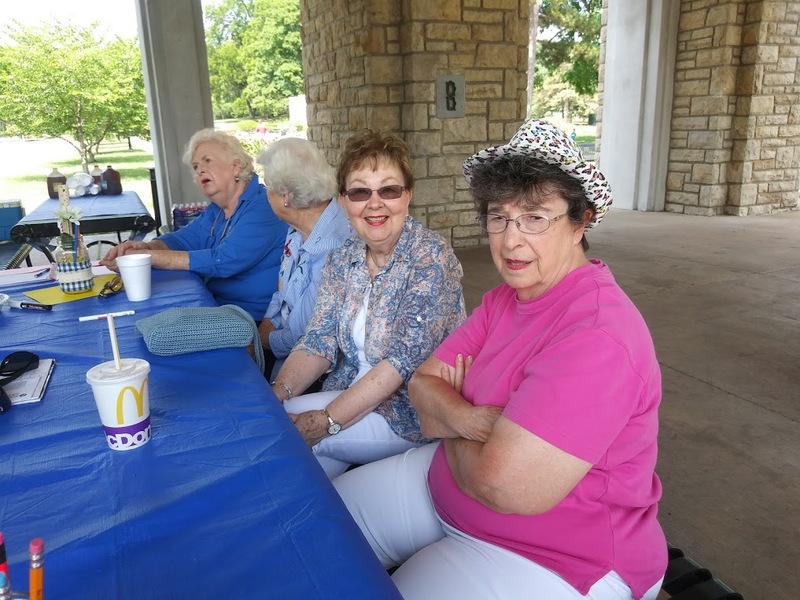 Of course we had many of our "regulars" at the '57/57 and I just want to (finally, you say) say thanks to everyone who came out and helped to make our picnic a fun and successful one. Don't forget our next luncheon will be Saturday, Oct. 11 at the same place as the last luncheon was........ McCoy's in the Westport area. We will discuss the picnic and also the Christmas Adoption Program. It's only taken me 2 days to write this note. I had to stop and wake myself up at the keyboard numerous times so if you see any real funky errors, I assure you they were made during my sleep time. I have already corrected too many to number. Until next time, take care and remember you are one of a kind and can't be replaced. 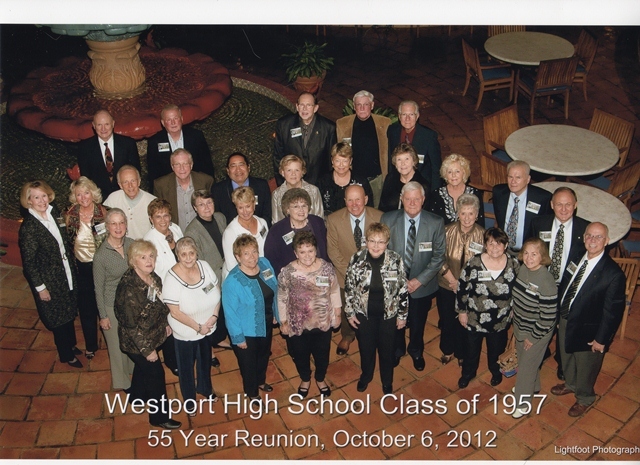 We had a very nice 55th Class Reunion on Saturday, October 6th, 2012. The main event took place at the Embassy Suites Hotel near the Plaza with plenty of time to visit and renew old friendships. The buffet meal was very good and the desserts were delicious. We had a chance to watch the video from the 50th reunion and it was great to see that again. We had 32 classmates along with 25 spouses/friends that were able to attend the Saturday event. That added up to 57 which is a coincidence since we are the class of "57. The Philgreen "boys" provided a church service on Sunday morning which was very nice of them to do and we appreciated the time and effort that took. Some of the classmates met for lunch at the Rozelle Court restaurant which is in the middle of the Nelson Atkins Art Gallery. They all enjoyed a little more time together. 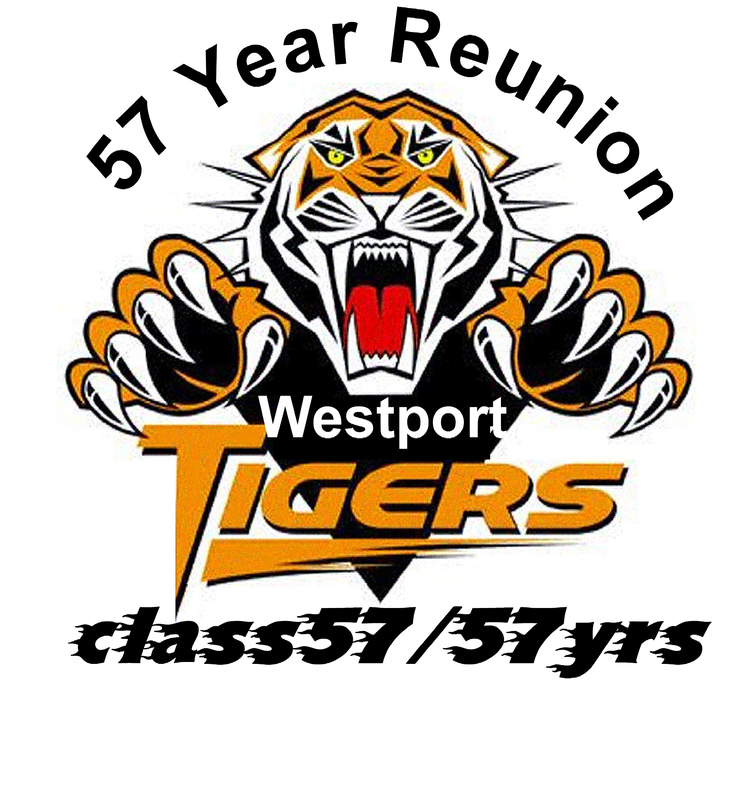 A big thank you goes out to the committee members of the 55th Reunion of the Westport Class of 1957. 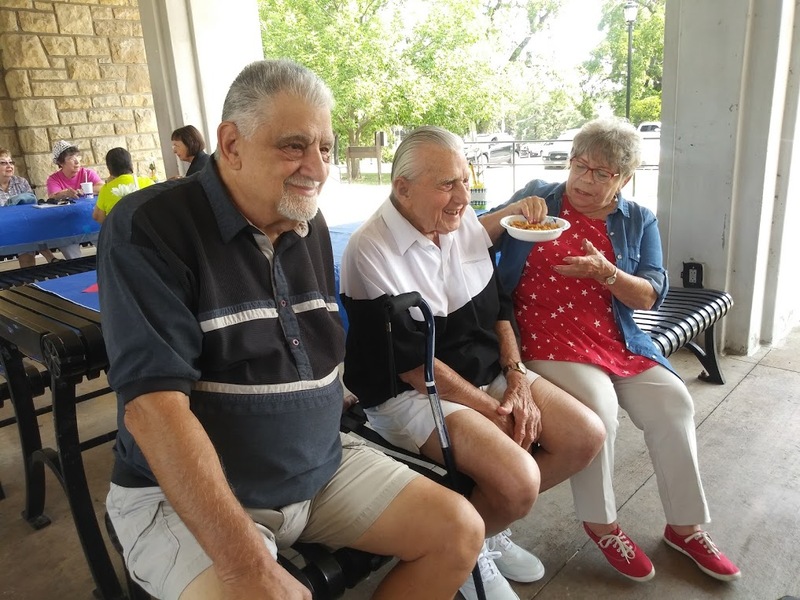 They are Juanita Furness Candillo, Ron Philgreen and Mary and Augie Ruf. They did a great job of putting together the reunion. Please check this website often for future announcements, news from your classmates or anything that may be of some interest to you and your classmates. We would love to hear from you and also see pictures. 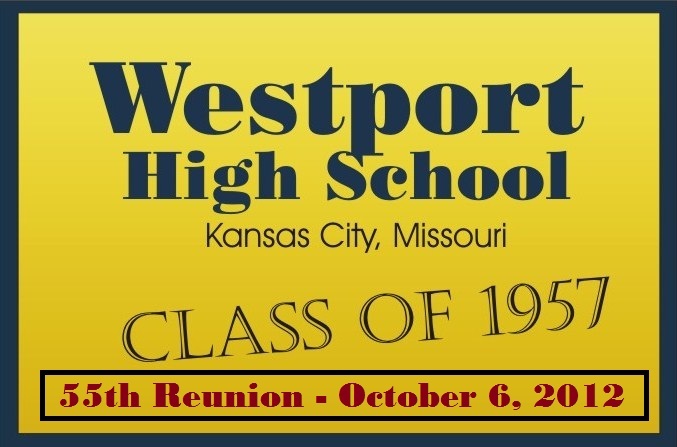 Kansas City Public Schools (KCPS) has invited two short listed teams to present proposal updates for Westport High and Middle on April 6, 2913. Each short-listed team will be allotted time for its presentation and for Q&A from the meeting participants. This is a great opportunity for local stakeholders to not only learn about the proposals and to ask questions, but also to provide feedback to the district. For detailed questions and arrangements, please contact Nichole Collier White at 816-418-7745. Thank you for your interest and we look forward to seeing you at this upcoming meeting. 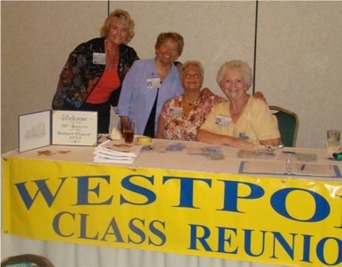 This web site has been established as a communication vehicle for the Westport High School, Kansas City, Missouri, Class of 1957 Reunion Committee. It is intended to provide a two way communication between all of our classmates. Classmates, please submit news, stories, photos and other information you would share on the website. 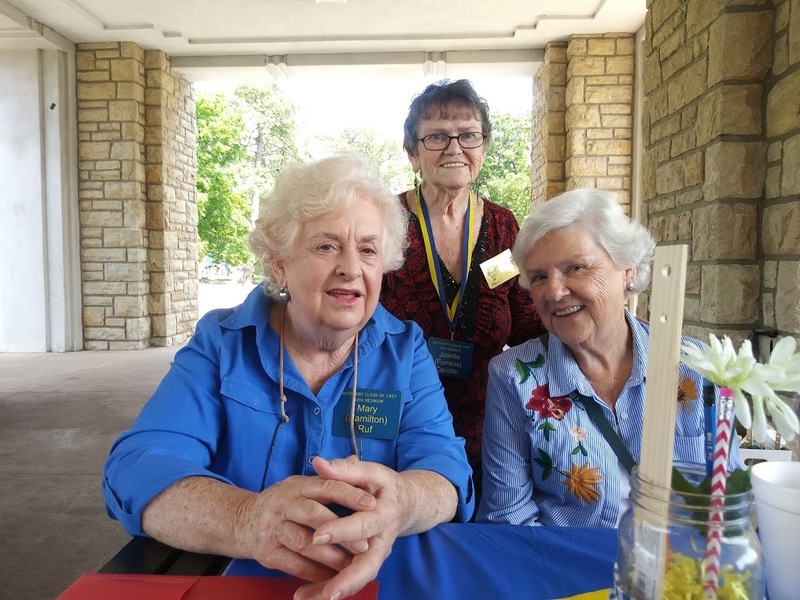 The 50th Reunion held on October 5th, 6th and 7th (2007) with a wonderful schedule of events. 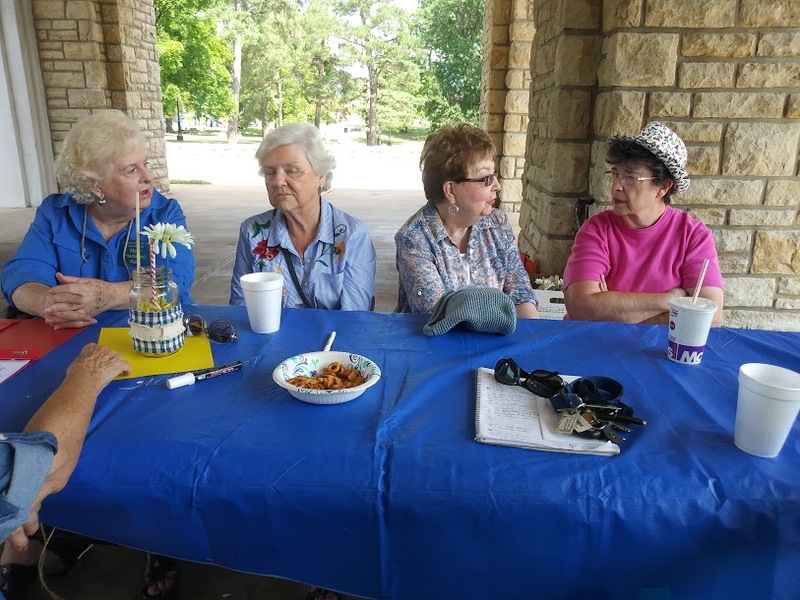 The reunion committee had everything coordinated and everyone had a great time. To find out a little more about the reunion and see pictures, select 50th Reunion from the Contents selection above. Click here to check out these reunion pictures. 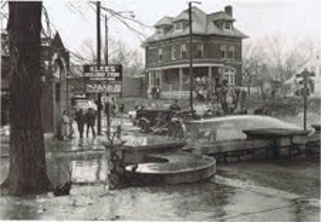 Our website has some changes now that the 50th Reunion is now behind us. Classmates should add their comments and updates they would like to share by visiting "News and Photos" on the tabs above. We encourage our classmates to tell us about yourself, your family, your vacations, etc. Remember, this is a public site so your contributions will first go to the Westport57 webmaster for approval before it is actually posted. You can also email Jim Carras (jim@carras.com) with any photos and captions. This will keep any unwanted information posted from those who are not classmates. You will find a section at the bottom of the page where you can also submit your comments. As always, please feedback your ideas and recommendations at the bottom of this page, on how we can improve our website. Trying to find out how Westport High became the Tigers - from Westport Crier series How to submit information to be posted on this web site.